HSBC is close to buying a majority stake in Iraqi bank Dar Es Salaam Investment bank, according to one of the global bank's senior executives. HSBC is in talks to buy a 70% stake in the Iraqi lender, which has 14 branches across Iraq and employs 450 staff. HSBC was one of three foreign banks given permission last year to start trading in Iraq. But high levels of violence have so far hindered the development of the country's banking system. HSBC hopes to buy the company from its main shareholder, the Khudairy family. David Hodgkinson, chief executive of HSBC's Middle East operation, said the bank was "very close" to concluding an agreement. He said HSBC hoped to develop the bank's services by investing in computerised payment systems and cash machines. "I think because the banking system in Iraq is still in its fairly early stages of development, it will be a question of putting in place fundamental services," he told Reuters. 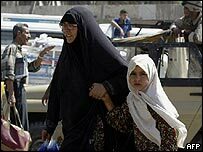 Foreign banks were banned from Iraq under Saddam Hussein although a number of private banks were licensed to operate. After Saddam Hussein was overthrown, HSBC, Standard Chartered and National Bank of Kuwait were licensed to operate in Iraq. Any deal would have to be approved by the Central Bank of Iraq as well as the board of Dar Es Salaam. With operations in Bahrain, Jordan, Kuwait, Lebanon, Oman and Qatar and the Palestine Authority, HSBC claims to be the largest international banking group operating in the Middle East.